Fickle Prickles - Cacti & Succulents: 5 Mothers Day Gift Ideas Hand Made By You! 5 Mothers Day Gift Ideas Hand Made By You! A succulent wreath can last for years to come and can be placed down flat on a table, or hung up on a door or wall. What you will need: Everything you will need to make your own Succulent Wreath comes in our Succulent Wreath Kits. They come in two sizes: Succulent Wreath Kit - 12 inch and Succulent Wreath Kit - 14 inch. How to do it: For full instructions on how to make a wreath, check out our tutorial - How to make a Succulent Wreath. Potted Succulents are incredibly versatile - place them indoors or outdoors, on a table, shelf, window sill or on the ground. Give them that special touch by painting the pot or by making your own gift tag on a spike - Your mum will love it! Supplies: pots, potting mix, fertiliser, pebbles and sphagnum moss are available under Supplies. Plants: Pick something from the Collectables Range for something a touch more unique. Potted Kits are also available. How to do it: Check out Succulent Art's website for project tips and tricks on how to pot up succulents. 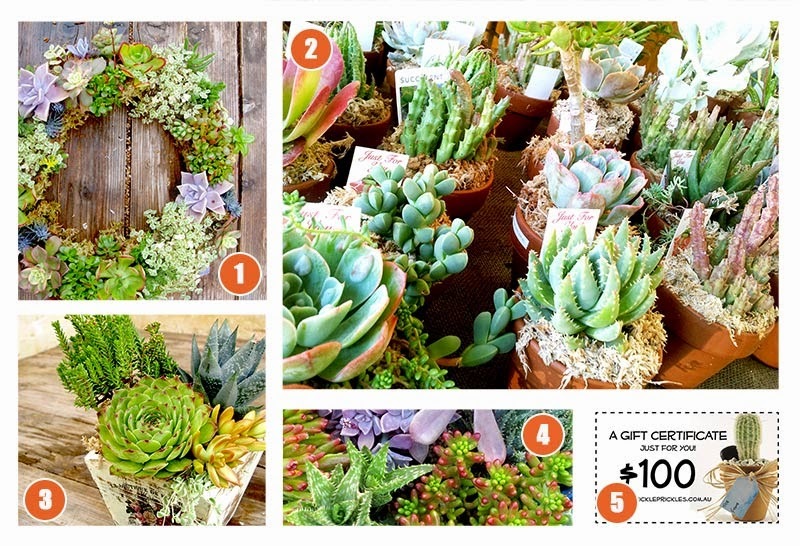 Here's where you get to have fun picking a container to plant your succulents into. It can be anything! Wooden boxes, ceramic planters, tea cups, old toys, shoes! Look around in your back shed or your local op shop for inspiration. Supplies: potting mix, fertiliser, pebbles and sphagnum moss are available under Supplies. Plants: Try a mix of Collectables and 50mm Succulents. How to do it: Check out Succulent Art's website for tips on selecting succulents and arranging them in your potted succulent gardens. Whether they be for her garden or for a particular succulent project, your mum will love a range of succulent plants to play with and admire. We have seasonal mixed selections in various quantities,as well as a selection of entirely Sedums and a selection with vertical gardens in mind. See Mixed Selections for more details. Overwhelmed by choice? Let her decide! Fickle Prickles Gift Certificates come in a variety of prices and are valid for one year. They can be spent on anything on our website, or bring it along to the next Kalamunda Markets. See Gift Certificates for more details.